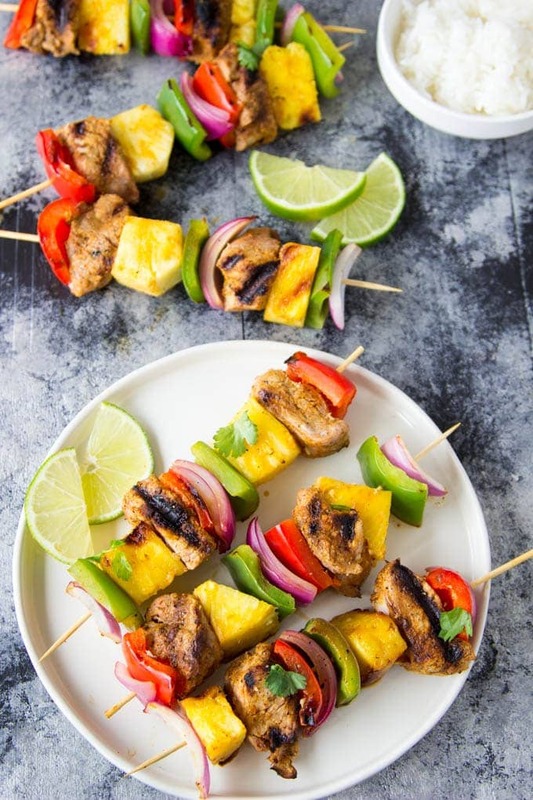 Curry Pork + Pineapple Kabobs- The perfect combination of savory and sweet! 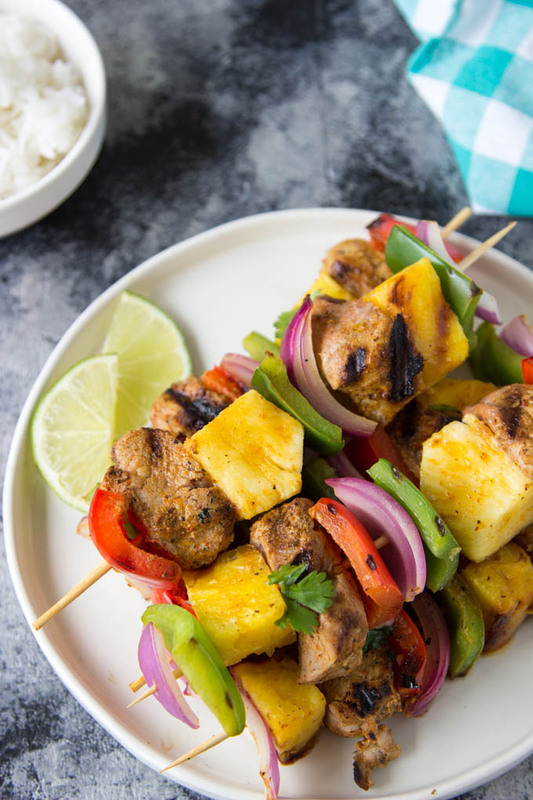 You can whip up these nutritious skewers of juicy curry marinated pork, red and green bell peppers, onions and sweet juicy pineapple in just a few minutes. Fire up the BBQ or cook them indoors on the stove-top or in the oven. Kabobs! They are the quintessential summer BBQ food. I mean why not? 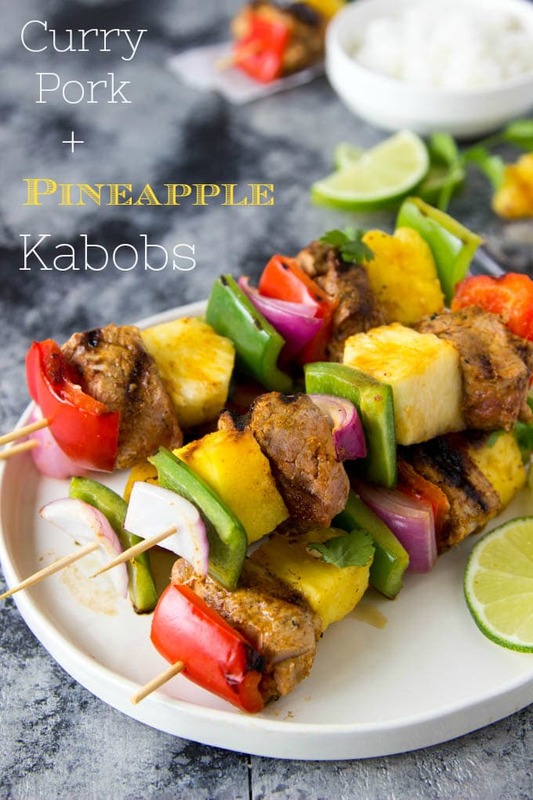 they are SO easy to make plus the whole meal comes together on one skewer! Have you ever tasted grilled pineapple? oh my! magic happens when pineapple hits the BBQ, it takes on a slightly smokey and caramelized flavor. Pair that up with pork that has been marinated in a mixture of Greek yogurt, curry powder, brown sugar, soy sauce, turmeric , coriander and lime and you’ve got a sweet and savory party happening. 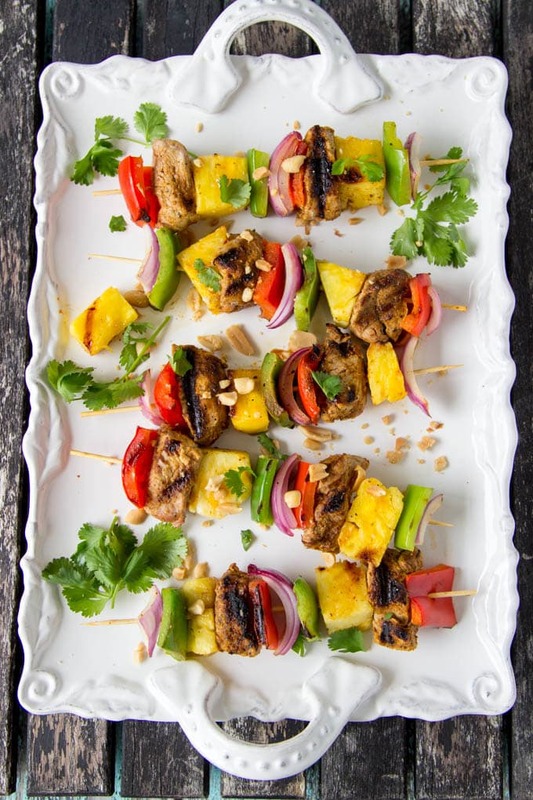 Finish everything off by garnishing the kabobs with fresh cilantro, a squeeze of lime and chopped peanuts. Serve over rice, cauliflower rice, zoodles or your favorite chopped salad greens. Try tucking them into a tortilla and making a wrap (they would be great with some peanut sauce). Versatile, easy, sweet & savory! In a medium sized bowl, whisk together marinade ingredients (yogurt, curry powder, brown sugar, soy sauce, turmeric, lime, lime zest, coriander and salt) Stir until well combined. In a gallon size ziplock/resealable plastic bag (or large shallow bowl) pour marinade over pork cubes, seal, and refrigerate for at least 1 hour ( up to 6 hours). Seed and trim the bell peppers, and cut into 1 inch pieces. Peel and chop the onion into similar sized pieces. Preheat the BBQ grill or grill pan to medium. (if using oven to cook see directions in the notes section below). 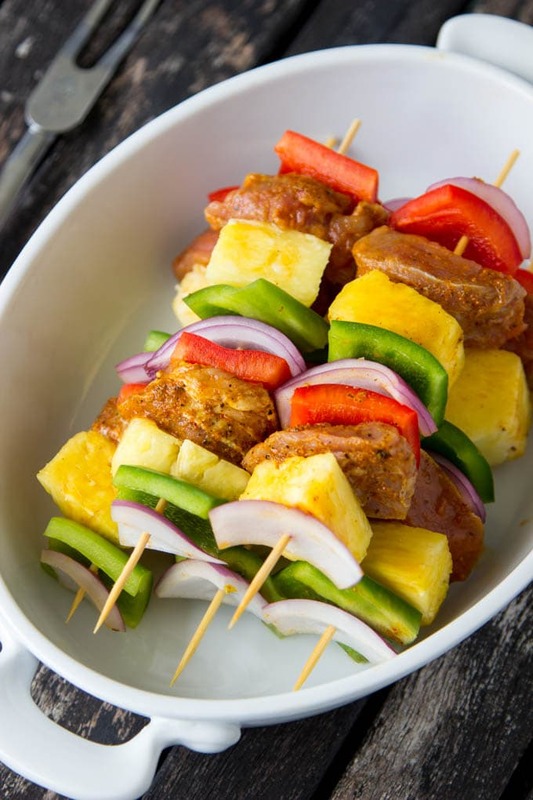 Thread 12 skewers with alternating pieces of onion, bell pepper (red and green), pineapple, and pork until all the pieces are used. Optional step- spray each skewer lightly with cooking spray. Grill skewers 3-4 mins on each side until pork is cooked through (approx.12-16 min.total) being careful not to overcook (pork will continue to cook slightly once removed from the grill). Garnish cooked skewers with fresh cilantro, chopped peanuts and a squeeze of lime if desired. * If cooking in the oven:Preheat the broiler on high for 5 min. Place skewers on a broiler pan or a sheet pan with wire racks set on top. Holy drool. These look SO stinking amazing. Definitely pulling in the grill master hubby for these guys!